Coming soon... ink you can eat! Coming soon... inks you can eat, or also referred to as edible inks. Why on earth would you want to eat your inks? Well, for printing digital images onto your cakes! For example, you will be able to print that photo of your son or daughter to put onto their birthday cake. Personalize cakes, cupcakes, or other baked goodies by simply printing your desired image onto a sheet of edible paper (yes, you can eat the paper too which are also known as frosting sheets), and apply the printed frosting sheet to your cake. All this, on a simple sub $100 inkjet printer! 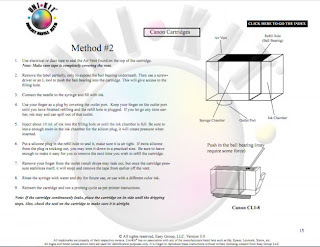 We have been working long and hard to test and bring to market a comprehensive solution for edible inks and edible paper (frosting sheets) and will be releasing it soon. You will be able to print your cakes and eat them too! Questions? Comments? Please post and we will be happy to respond. Glossy optimizer inks are used in select printer cartridges, such as cartridges for Epson R800 / R1800 / R1900 and Kodak #10 cartridges. 2) What is the least refill friendly printer? With around 100 votes in so far, there is an interesting picture that is being painted by voters. So its not surprising that Lexmark is being selected as the "least refill friendly printer". Dell cartridges are made by Lexmark, and Dell is the 3rd least popular for refills in the same poll. What is interesting though, is that HP is currently in 2nd place as the least refill friendly printer, yet, it is also currently in 2nd place as the "most" refill friendly printer. Lets analyze this for a moment... how can a printer brand be both highly popular for refills, and highly unpopular at the same time? Our take on this is that HP has flip-flopped over the years, putting out refill friendly printer cartridges, and refill unfriendly cartridges as well. So customers who have bought the refill friendly cartridges, are happy with HP, and customers who bought the unfriendly for refills cartridges, are obviously unhappy with HP. 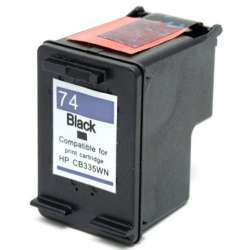 Some HP cartridges are easy to fill. For example, the HP 94, HP 95, and other HP 90 series. 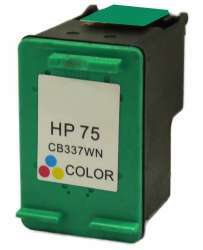 But other HP cartridges like the HP 940, HP 920 and HP 564, are not as friendly because they have chips! A customer who bought an HP 94, would probably consider HP a refill friendly brand. 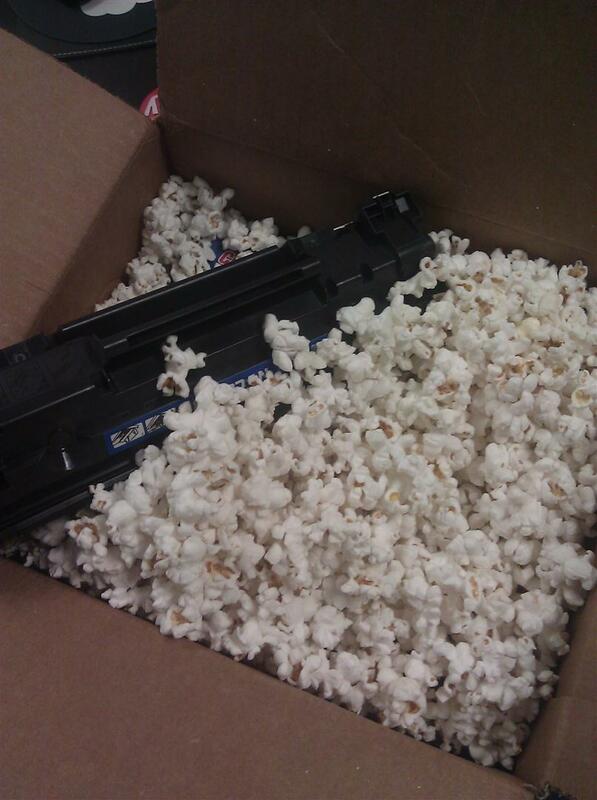 But a customer who bought the HP 920, would consider it refill unfriendly. It would server HP well to continue down the path of being refill friendly. Yes, they will lose some market share to the aftermarket, but the aftermarket will promote their brand and HP will benefit as well. That's our short analysis on the poll results so far. Please vote and let us know what you think! The poll is open to anyone and is visible to the right of the page. 123 Refills has been conducting a poll of casual internet users to see what they think of OEM (original brand) cartridges - are they overpriced? Or do they offer value for money? With the various marketing spins out there, one would think that consumers opinion could be easily affected. 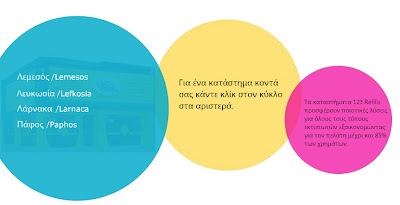 HP has invested a good sum to promote its "ink amnesty" marketing campaign, for example, whereby it claims that 3rd party ink suppliers offer inferior products. They have also commissioned a "study" to prove that OEM HP ink and toner is better value than remanufactured ink or toner supplies. Lexmark commissioned a similar study a couple of years ago incidentally, which (probably embarrassingly to Lexmark) found that original Lexmark inks fail a significant percent of the time! Without digressing too much, lets zero in on what consumers really think. Now, agreed, our study is not a scientific one, and could be skewed by the visitors that land on our blog site (including our customers), and the number of voters is around 60 currently (which allows for a higher margin of error), however the results are trending quite clearly... over 90% of respondents are saying that OEM cartridges are overpriced. 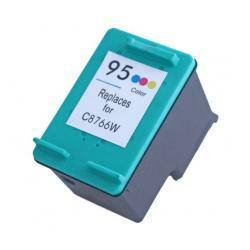 It is also important to note that our website offers OEM cartridges for sale alongside remanufactured cartridges, and we do sell a lot of OEM cartridges, so our users are not necessarily biased towards "only" remanufactured cartridges. What do you think? Vote to the right of the page and let everyone know what you think... are OEM cartridges overpriced? Or do they offer value for money? 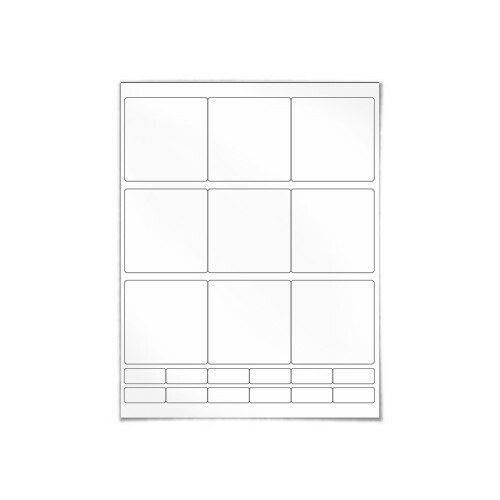 Thereby allowing you to hone in to the subset of printer models that will help you find exactly what you need quickly and accurately. 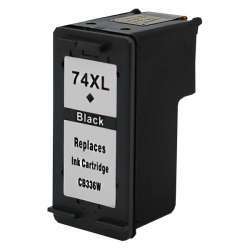 If you own a Canon printer that uses the PGI220 or CLI221 ink cartridges (PGI-220 / CLI-221 series), you know that the cost of new replacement inks is over $15 per cartridge if you buy original brand ink cartridges from an office supply store such as Office Depot. 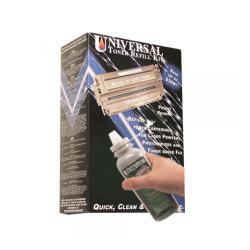 Refilling them is smart and easy to do with Uni-Kit inkjet refill kits. Here's how you can get approximately 56 refills for the price of only $39.99 (hint, sign up for our monthly newsletter and get additional discounts). 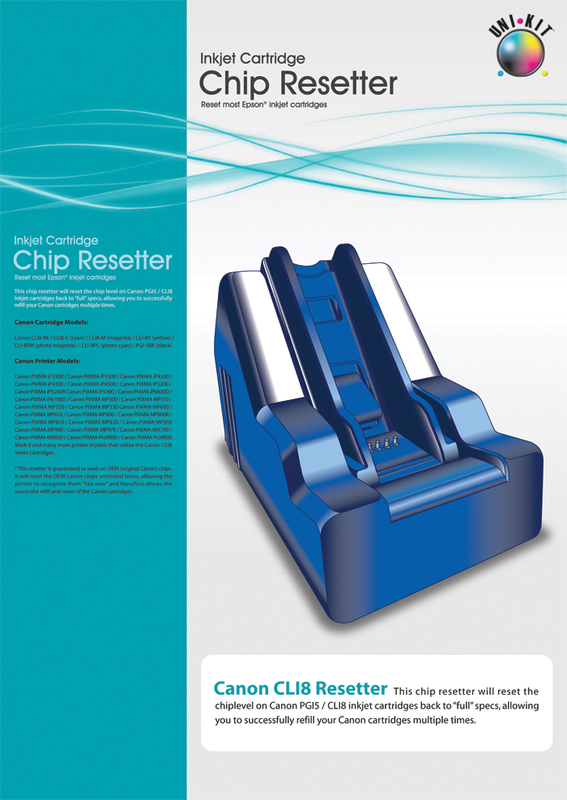 A resetter (sold for $19.99) or replacement chips (sold for $1.99) are also required. The resetter is reusable and will yield hundreds of resets. You will need to either reset the chips on the cartridge, or replace the chips. 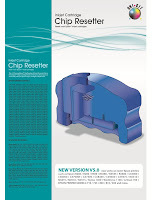 The resetter is a cheaper (in the long term) and more environmentally friendly way to go, since you are re-using the original chips. The Uni-Kit resetter for Canon PGI220 / CLI221 is battery operated, and re-usable for hundreds of resets. This Canon CLI221 resetter is available from 123 Refills as well. 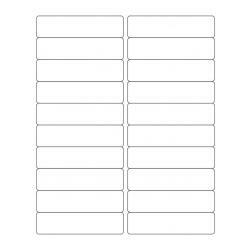 The one time cost for this resetter is easily recoverable over just a few refills. 1. Using a manual drill or the small drill provided with your refill kit, drill through the plastic casing on the side of the cartridge (see image for location). Drill enough to break through the plastic. Do not drill into the sponge area beyond the inner plastic casing. 2. Once the hole has been created, use the syringe to penetrate through the sponge, and guide the needle into the ink chamber as shown in the illustration to the left. Slowly inject the ink into the chamber until 1/2 of it has been filled. Do not fill to the chamber more than the recommended amount. Doing so will cause more ink to flow into the sponge area, forcing ink to exit through the nozzle port (Area where the ink flows out of the cartridge). 3. Once the cartridge has been filled, carefully pull the needle out of the cartridge. It is recommended that you use hot glue to seal the hole created, however, you can use silicon to cover the hole, and help complete the seal with some type of instant glue. 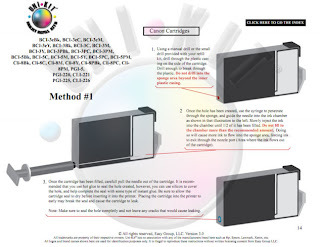 Be sure to allow the cartridge seal to dry before inserting it into the printer. 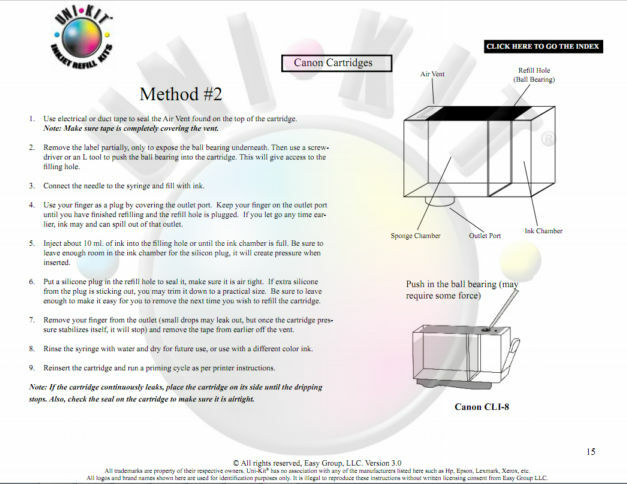 Placing the cartridge into the printer to early may break the seal and cause the cartridge to leak. until you have finished refilling and the refill hole is plugged. If you let go any time earlier, ink may and can spill out of that outlet. enough to make it easy for you to remove the next time you wish to refill the cartridge. 123 Refills is offering free shipping on all orders during earth week (April 18 - 22, 2011). All orders for shipping to contiguous US States qualify, including orders for ink refills, toner refills, ink cartridges and toner cartridges. Earn up to 30% commission through 123 Refills - an online leader in ink / toner cartridges and refills. 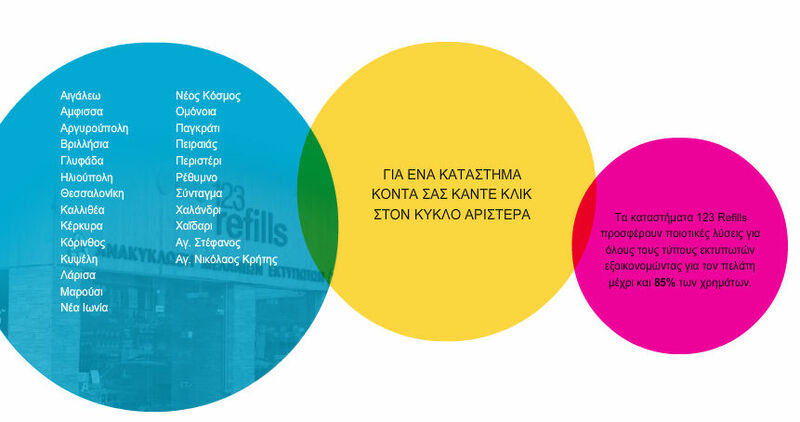 123 Refills is a worldwide brand with millions of cartridges and refills sold through its network. Customers trust the brand, and the website offers over 2,000 products - from popular models to niche models as well. 123 Refills is the ONLY website to offer not only ink/toner cartridges, but DIY ink/toner refills and refill services as well, making the cross-sell of items very successful. Commission is structured at 25% for 1st tier and 5% for 2nd tier. 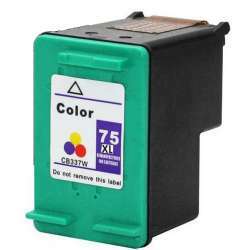 OEM cartridges (original brand cartridges) do not qualify for commissions. 123 REFILLS has teamed up with ShareASale to offer a simple affiliate signup process, so that you can begin earning commission payments from your website as soon as possible. The worldwide hardcopy peripherals market witnessed record high shipments of more than 36.5 million units in the fourth quarter of 2010 (4Q10) and posting 7% year over year growth. According to the International Data Corporation (IDC), this is the highest quarterly shipments since the fourth quarter of 2007. Overall, the worldwide hardcopy market continues to aggressively transition away from single function into the multifunction space. In 4Q10, the total share of multifunction printers (MFP) was 67%, up four points from the previous quarter. Sales of ink cartridges and toner cartridges have been boosted by the highest increase in growth for the printer and copier market since the recession. Data from market research firm IDC shows that during the last three months of 2010 the market grew by seven per cent in comparison to 2009 and the highest since 2007, the Inquirer reported. In particular, multifunction printers, which use ink cartridges, increased their market share to 67 per cent and inkjet printers remained the industry leader, with 24.5 million units being shipped in the last three months of 2010. "After experiencing one of the most difficult economic periods in recent memory, the worst is over. It's time for the market to return to normal. For 2011, we anticipate that the recovery will continue at a slow and steady pace. The return to growth will not be uniform across all countries and segments; developed regions are expected to show gradual or steadier activity, while developing regions are projected to show faster and higher growth levels," said Phunog Hang the IDC program manager. The top three vendors – HP, Canon, and Epson – captured more than 75% share of the total market in 4Q10. With 15.5 million units shipped, HP exhibited the highest year-over-year growth of 10%, followed by Canon's 5% and Epson's 2%. With the exception of Western Europe, HP enjoyed positive year-over-year growth across all regions. Inkjet remains the dominant technology in the overall hardcopy peripherals market with close to 24.5 million units shipped, representing 67% share. The fourth quarter saw year-over-year inkjet declines in the Asia/Pacific (excluding Japan) (APeJ), Middle East & Africa (MEA), and Western Europe markets. The highest year-over year-growth was observed in Latin America at 16%. This quarter marks the highest laser shipments with close to 11 million units shipped. All regions recorded year-over-year growth in this space, with Latin America leading the way with 35% growth, and Central & Eastern Europe (CEE) at 25%. Monochrome laser accounted for 83% of the laser market with 9 million units shipped in 4Q10. Although the transition to MFP has been observed, monochrome laser printers remain the most prolific type of laser in the office with close to 5.6 million units. Color laser grew 10% year over year to over 1.8 million units, resulting in 17% share in the total laser market in 4Q10. Color laser MFP continues to show signs of expansion and has increased its share in the color laser space to by over two points to 48% when compared to share seen in the previous quarter. United States – With only 120K fewer shipments than Western Europe, the region came in 2nd overall with 22% market share and 5% year-over-year growth. Unlike the double-digit growth experienced in the last two quarters, Q410 saw a modest year-over-year trend of 5% growth in laser technology. 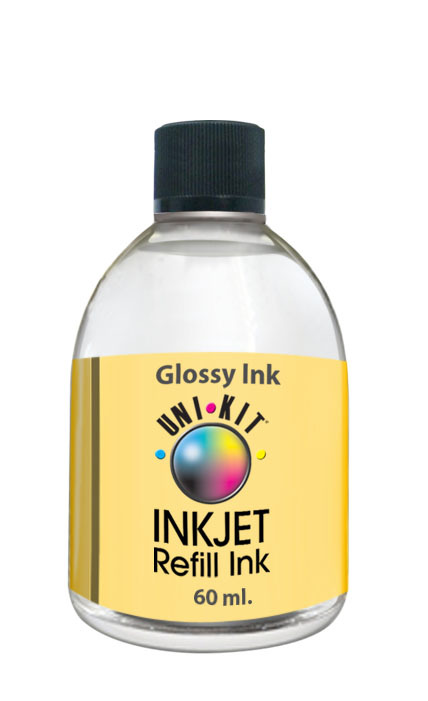 The inkjet market also recorded a 5% year-over-year gain with more than 6.6 million units shipped during the quarter. Western Europe – After losing out to APeJ during the past two quarters, Western Europe regained its status as the number 1 region for total HCP shipments in Q410 with more than 8 million units shipped. The region grew 2 points to 23% share in the worldwide hardcopy peripherals market compared to the previous quarter. This positive trend was driven by the stronger year-over-year growth in laser technology – 10% versus -1% for inkjet. Central Eastern Europe & Middle East and Africa (CEMA) – The region accounted for 14% share of the worldwide market with close to 5 million units, and exhibiting 8% year-over-year growth. Double-digit growth in Central & Eastern Europe (CEE) fueled the high growth in the region. Despite year-over-year growth of -2%, inkjet technology regained the top spot in the region after losing out to monochrome laser during 3Q10 with close to 2.5 million units shipped and posting over 50% market share. The laser segment increased 22% year over year to more than 2.3 million units shipped in the quarter. Asia/Pacific (excluding Japan) (APeJ) – For the first time in 2010, APeJ lost its top spot to become the number 3 region in the world in terms of HCP shipments. Despite posting 11% year-over-year growth in Q410, the region lost 4 points to 22% share in the worldwide market. APeJ continues to be the top ranked region in the worldwide laser market with 30% of total shipments, while its inkjet shipments ranked 3rd with 15% in the total inkjet market. For the first time ever, Canon inched past HP and achieved the number 1 ranking in the APeJ inkjet market. Japan – Japan moved up one spot to become the number 6 region in the last quarter of 2010. Japan accounts for 8% share of the worldwide market with close to 2.8 million units shipped, and posting 5% year-over-year growth. The inkjet segment grew 3% year over year to close to 2.4 million units shipped in 4Q10. The last quarter of the year is consistently the highest volume quarter for inkjet shipments as consumers purchase devices to print and send New Year's cards to family and friends. Driven by high demand in the Small and Medium business segment, 4Q10 came in with strong results in the laser space, resulting in more than 380,000 units shipped and 17% year-over-year growth. HP dominated the market with over 15.5 million units shipped in 4Q10, the highest quarterly shipment since the last quarter of 2007. The vendor grew 10% year over year, the highest year-over-year trend among the top 5, and gained 2 points to 42.5% share in the total worldwide market in 4Q10. With the exception of the Western European inkjet market, HP showed year-over-year gains across all regions in both inkjet and laser segments during the last quarter of the year. The vendor closed out the year on a high note, posting 15.6% year-over-year growth for the full year and outperforming the market average by nearly 4 points. Despite having the highest shipments ever, Canon finished a distant second overall with close to 6.9 million units and 18.8% share in the total hardcopy peripherals market in the fourth quarter. During 4Q10, the vendor grew its shipments 5% year over year, gained 2 points in market share sequentially and remained unchanged from a year ago. This quarter marked the first time ever where Canon inched past HP and achieved the number 1 ranking in the APeJ inkjet market. While achieving stellar results in Asia/Pacific (excluding Japan) with 1.4 million units, the vendor's inkjet segment only grew 1% year over year. Laser technology, on the other hand, enjoyed double-digit growth across most regions and resulted in 24% year-over-year increase. Canon finished the full year 2010 with 7.5% year over year growth in total shipments, nearly 5 points below the market average of 12% growth. Epson held the number three position overall in 4Q10 with more than 5.5 million units shipped and 2% year-over-year growth. While showing an increase year over year, the vendor declined 1 point from a year ago to 15.2% market share. Canada and the U.S. were Epson's best performing regions, with 46% and 30% year-over-year growth, respectively. The vendor completed finished 2010 with 9.7% year-over-year growth. Once again, Canada and the U.S. were among the top 3 regions in 2010 with 41% and 14%, respectively. Latin America was Epson's best performing region for the full year with 45% year-over-year growth. Brother moved up one spot from last quarter, and in 4Q10 was the fourth-ranked vendor in the worldwide hardcopy market with 5.1% share and close to 2 million units shipped. The vendor's shipments grew 8% year over year in 4Q10 due to stronger gains in the laser segment; 16% vs. 1% for inkjet. Latin America was Brother's best performing region in 4Q10 for laser shipments with 94% year-over-year growth, followed by 57% in Asia/Pacific (excluding Japan) and 46% in Middle East & Africa. Despite posting significant growth in laser, the vendor's 5.5% year-over-year increase for the full year 2010 was below the market average of 12%. While having its highest shipments ever, Samsung dropped one spot from last quarter to the number 5 position in the total hardcopy peripherals market. The vendor grew 3% year over year during the last quarter of 2010, resulting in more than 1.7 million units shipped and 4.8% market share. Samsung's 4Q10 performance was aided by positive growth in Western Europe and Latin America, which grew 22% and 28%, respectively. The U.S. was Samsung's worst performing region in 4Q10 with a -34% year-over-year trend. Samsung outperformed the market by posting 28.2% year-over-year growth for full year 2010. 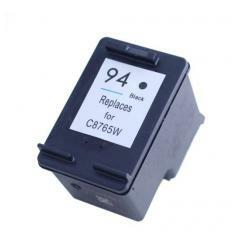 If you are looking to buy inkjet printer cartridges or buy laser toner cartridges or ink / laser toner printer cartridge refill kits visit 123Refills.com. Support the 123 Refills green mission to be environmentally responsible by recycling printer cartridges that keeps tons of trash out of landfills.